If you ride a bicycle, odds are that at some point you will be involved in an accident. When bike crashes occur, you can end up facing serious injuries and significant obstacles to receiving compensation for those injuries. The following are some important things to remember if you are ever in a bicycle accident. Seek medical treatment anytime you are in a bicycle accident. Many cyclists insist they are fine after an accident and continue on their way. Instead of responding this way, take your time in getting back on your bicycle. Before trying to cycle again, you should make sure that you can move your arms in all directions without any accompanying pain. It is also a good idea to see if your bicycle helmet is cracked, which suggests that you might have suffered a concussion. Wait for law enforcement to arrive at the scene of the accident so that you can file a police report. This is almost always a good idea, even if you do not think you were injured in the accident. For one, some bicyclists do not realize that they have been injured until several hours after an accident occurs. Second, if you leave the scene of an accident without a police report, there is a possibility that you might never be able to determine who caused the accident. If it is possible to do so, it is a wise idea to obtain contact information for the driver who caused the accident, including his or her name, address, driver’s license number, and phone number. Write everything down yourself; do not assume that these details will be included in the police report. If possible, you should write down notes about how the accident occurred, including the weather and road conditions at the time. Leave your bicycle and any other damaged property in the same condition; in other words, do not get your bike fixed. Avoid communicating with the other party’s insurance carrier without first speaking with a knowledgeable attorney. 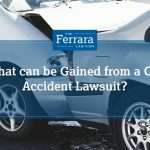 Anything that you say to the insurance company could potentially be used against you at a later date and even lead to the offer of a lower settlement amount. Many bicycle accidents occur in New Jersey every day. 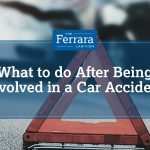 If you or a loved one is harmed in a bicycle accident, you should not hesitate to speak with an experienced personal injury attorney at Ferrara Law. Contact our law office today to schedule an initial free case evaluation.